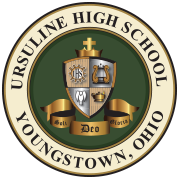 The Class of 1969 returned to Ursuline for a reunion meeting on Wednesday, November 7. The reunion planners enjoyed lunch in the gymnasium and a tour of the school. Posted in Alumni News, News. Kevin Freisen ’86 (pictured center) shared his financial expertise with Mrs. Eleanor Klucinec’s College Prep Math class this week. Kevin is a manager at First National Bank. Alumni and parents are always welcome and encouraged to join us as guest lecturers or as presenters at Career Morning (set for May 11th this year).